to ensure that unused switch ports do not become security holes. The following sections describe how to mitigate hardware, environmental, electrical, and maintenance-related security threats to Cisco IOS devices. Improper and incomplete network device installation is an often-overlooked security threat that, if left uncorrected, can have dire results. Just like a typical PC or server configured with default settings presents a security threat, the same is true for Cisco devices. But software-based security configuration measures alone cannot prevent premeditated or even accidental network damage because of poor installation. The command-line interface (CLI) is used to configure the password and other console commands. Examples 2-4, 2-5, 2-6, and 2-7 show the various passwords to be configured on a switch. CAUTION The passwords used in this text are for instructional purposes only. Passwords used in an actual implementation should meet the requirements of a “strong” and “complex” password. You can secure a switch by using passwords to restrict various levels of access. Using passwords and assigning privilege levels are simple ways of providing both local and remote terminal access control in a network. Passwords can be established on individual lines, such as the console, and to the privileged EXEC (enable) mode. Passwords are case sensitive. Each Telnet (VTY) port on the switch is known as a virtual type terminal (vty). By default There are five VTY ports on the switch, allowing five concurrent Telnet sessions, noting that other Cisco devices might have more than five logical VTY ports. The five total VTY ports are numbered from 0 through 4 and are referred to all at once as line vty 0 4 (notice the space between 0 and 4). By syntax, this would include the range from 0 to 4, so it includes all five logical VTY ports, 0–4. Use the line console 0 command, followed by the password and login subcommands, to require login and establish a login password on the console terminal or on a VTY port. By default, login is not enabled on the console or on VTY ports. Note that you cannot establish a Telnet connection unless you first set all the vty passwords. If there are no vty passwords set, when you try to telnet in, you get a “password required . . . but none set . . .” error message, and your attempt to telnet is rejected. The line vty 0 4 command, followed by the password and login subcommands, requires login and establishes a login password on incoming Telnet sessions. Again, for Telnet VTY ports to accept a Telnet EXEC session, you must set the vty passwords. The login local command can be used to enable password checking on a per-user basis using the username and password specified with the username global configuration command. The username command establishes username authentication with encrypted passwords. The enable password global command restricts access to the privileged EXEC (enable) mode. You can assign an encrypted form of the enable password, called the enable secret password, by entering the enable secret command with the desired password at the global configuration mode prompt. If the enable secret password is configured, it is used (and required) instead of the enable password, not in addition to it. You can also add a further layer of security, which is particularly useful for passwords that ross the network or are stored on a TFTP server. Cisco provides a feature that allows the use of encrypted passwords. To set password encryption, enter the service passwordencryption command in global configuration mode. Passwords that are displayed or set after you configure the service password-encryption command will be encrypted in the output. This includes the encrypting of the passwords that might otherwise be displayed in plain text on the screen in the terminal output of a show command, such as show run. The CLI is used to configure the “message of the day” and other console commands. This banner can be used to warn others that they have accessed a secure device and that they might be monitored. You can define a customized banner to be displayed before the username and password login prompts by using the banner login command in global configuration mode. To disable the login banner, use the no form of this command. When the banner login command is entered, follow the command with one or more blank spaces and a delimiting character of any choice. In the example, the delimiting character is a double quotation mark (“). After the banner text has been added, terminate the message with the same delimiting character. SwitchX# banner login “ Access for authorized users only. Please enter your username and password. Telnet is the most common method of accessing a remote network device. However, Telnet is an insecure way of accessing a network device because it passes all command keystrokes, and all output back to the terminal, in unencrypted clear text. Secure Shell (SSH) Protocol is a secure replacement for Telnet that gives the same type of access. Communication between the client and server is encrypted in both SSHv1 and SSHv2. Implement SSHv2 when possible because it uses a more enhanced security encryption algorithm. First, test the authentication without SSH to make sure that authentication works with the switch. Authentication can be with a local username and password or with an authentication, authorization, and accounting (AAA) server that runs Terminal Access Controller Access Control System Plus (TACACS+) or Remote Authentication Dial-In User Service (RADIUS). (Authentication through the line password is not possible with SSH.) The following example shows local authentication, which lets you use Telnet to get access to the switch with username cisco and password cisco. To test authentication with SSH, you have to add to the previous configuration statements to enable SSH. Then you can test SSH from the PC and UNIX stations. If you want to prevent non-SSH connections, add the transport input ssh command under the lines to limit the switch to SSH connections only. Straight (non-SSH) Telnets are refused. Test to make sure that non-SSH users cannot telnet to the switch. You can use the port security feature to restrict input to an interface by limiting and identifying MAC addresses of the stations allowed to access the port. When you assign secure MAC addresses to a secure port, the port does not forward packets with source addresses outside the group of defined addresses. NOTE Before port security can be activated, the port mode must be set to access using the switchport mode access command. With the Cisco Catalyst 2960 series, use the switchport port-security interface command without keywords to enable port security on an interface. Use the switchport port-security interface command with keywords to configure a secure MAC address, a maximum number of secure MAC addresses, or the violation mode. Use the no form of this command to disable port security or to set the parameters to their default state. Example 2-8 shows the commands used to configure port security. A port must be in access mode (not trunk mode) to enable port security. You can configure an interface to convert the dynamic MAC addresses to sticky secure MAC addresses and to add them to the running configuration by enabling sticky learning. To enable sticky learning, enter the switchport port-security mac-address sticky interface configuration command. When you enter this command, the interface converts all the dynamic secure MAC addresses, including those that were dynamically learned before sticky learning was enabled, to sticky secure MAC addresses. The maximum number of secure MAC addresses has been added to the address table, and a station whose MAC address is not in the address table attempts to access the interface. An address learned or configured on one secure interface is seen on another secure interface in the same VLAN. NOTE Port security is disabled by default. 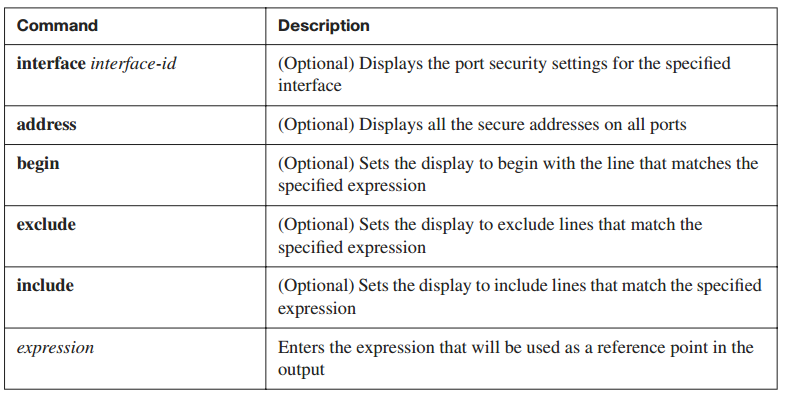 On the Catalyst 2960 series, use the show port-security interface privileged EXEC command, as shown in Example 2-9, to display the port security settings defined for an interface. An address violation occurs when a secured port receives a source address that has been assigned to another secured port or when a port tries to learn an address that exceeds its address table size limit, which is set with the switchport port-security maximum command. Table 2-8 lists the parameters that can be used with the show port-security command. In a home, an unlocked door can be a security risk. The same is true of an unused port on a switch. A hacker can plug a switch into an unused port and become part of the network. Therefore, unsecured ports can create a security hole. To prevent the issue, you should secure unused ports by disabling unused interfaces (ports). To disable an interface, use the shutdown command in interface configuration mode. To restart, or bring up, a disabled interface, use the no form of this command: no shutdown.